Shop for authentic replica Fort Moultrie flags. Our Fort Moultrie flags are constructed of durable nylon with a canvas heading and offered in five sizes. The Fort Moultrie Flag is also known as the Liberty Flag. It consists of a deep blue rectangle with a white crescent gorget at the hoist side, without a canton. The gorget was a recognized throat armor. Picked out in dark blue on the gorget is the word "Liberty." The Moultrie or Liberty flag has its origins in the American Revolutionary Wars of the late 18th Century. A treasured symbol of that Revolution, the Fort Moultrie Flag is also a symbol of the state of South Carolina. It is named after Colonel William Moultrie, a South Carolina planter and politician who became a very prominent figure in the American Revolution. Fort Moultrie sits at the south-western edge of Sullivan Island, a part of the estuary system which surrounds the entrance to Charleston Harbor. It is situated directly across from Fort Sumter, the sea fort which saw the first actions of the American Civil War, or War Between the States, in 1861. Fort Moultrie was commenced as a structure in 1776, during the American Revolutionary War. Originally built with indigenous palmetto tree fortifications. Colonel Moultrie assumed control of the fort and had it reinforced as part of preparations to repel British forces. The Carolinas were the focus of military conflict in both the Revolutionary and later Civil wars. Charleston particularly was and remains a vital strategic American port. 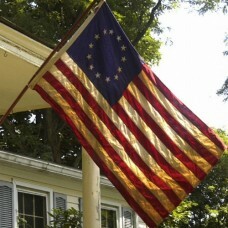 Realizing this, Moultrie had a flag designed to represent the wishes of Carolinian and other American Revolutionaries. Its inclusion of a vital piece of throat armor was to give courage to local militiamen. 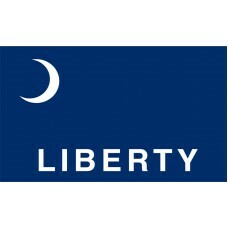 Colonel Moultrie first commissioned the Liberty Flag in 1775, as an inspiration for militia personnel defending Sullivan Island from attacks by the British Royal Navy. Originally, the word "Liberty" was absent from the crescent, but the design proved extremely popular and inspirational. The Fort Moultrie flag was flown in the successful American defense of Sullivan's Island against the British navy in June, 1776. This involved a 10-hour siege in which British ships pounded Fort Moultrie and the surrounding land on the Island. The fort was successfully defended, mainly by South Carolinian militiamen, including Moultrie's 2nd South Carolina Regiment. The British shot the original flag away from its original position, but it was rescued by a soldier who has become linked with the Moultrie Flag's legend. He was Sergeant William Jasper of the 2nd South Carolina Regiment, and he retrieved the flag in battle conditions. He then hoisted it himself as the siege continued. This military action saved Charleston from British re occupation. It was crucial in the eventual American victory over the United Kingdom. After many years of intermittent conflict, Charleston was liberated by the Americans in December 1782. The Fort Moultrie Flag was adopted by the Southern Continental and Militia Army, which played a vital part in eventual American victory. It is still held dearly as a symbol of the role of South Carolina in the winning of American independence.